کاسپر ون دین (اینگیلیسجه: Casper Van Dien) آمریکالی فیلم یاپیمجی‌سی و اوْیونچو. ۱۸ دسامبر ۱۹۶۸ ‏ ایلینده آمریکادا دۆنیایا گؤز آچیب. 1984 - گۆنوموز ایللر آراسیندا سینما ساحه‌سینده چالیشیب. 1991 Saved by the Bell Student (uncredited) Episode: "Pipe Dreams"
1992 Life Goes On Episode: "Udder Madness"
1994 Dr. Quinn, Medicine Woman Jesse Episode: "Cattle Drive: Part 1"
Episode: "Cattle Drive: Part 2"
1995 Silk Stalkings Roger Barrows Episode: "I Know What Scares You"
1995 Married... with Children Eric Waters Episode: "Blonde and Blonder"
1997 Outer Limits, TheThe Outer Limits Jake Miller Episode: "Heart's Desire"
2004 Rock Me, Baby Michael Episode: "Love at First Flight"
2008 Monk Lt. Steven Albright Episode: "Mr. Monk Is Underwater"
2009 Monk Lt. Steven Albright Episode: "Mr. Monk and the End: Part 1 & 2"
2010 Laugh Track Mash-ups James Episode: "Coopin' with Mr. Levy"
2012 Femme Fatales Episode: "One Man's Death"
↑ Road Rage (TV Movie 2000). 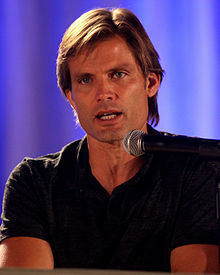 اینگیلیسجه ویکی‌پدیاسی‌نین ایشلدنلری طرفیندن یارانمیش«Casper Van Dien»، مقاله‌سیندن گؤتورولوبدور. ( ۲۲ ژانویه ۲۰۱۸ تاریخینده یوْخلانیلیبدیر). قارداش پروژه‌لرده کاسپر ون دین گؤره داها آرتیق بیلگی‌لر تاپابیلرسینیز.